The Office Romance Project is McKamey's newest program. With this program, we send out our adoptable dogs to spend an afternoon at a local business. 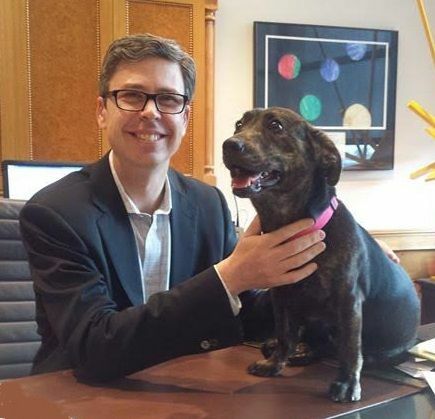 By partnering with local businesses and sending a dog out to spend time in your office while wearing an "Adopt Me!" vest, we hope the animal will gain attention from your staff and the public. With the dozens of dogs we have in our shelter at any given time, it is easy for some dogs to get overlooked. Getting our animals out of the shelter has proven to be very effective in getting them adopted and finding a forever home in the past. Click here to fill out a host application. Completed applications can be e-mailed to kmperkins@mckameyanimalcenter.org. Thinking about hosting one of our dogs for the day? Here are some ideas on how to make the most of your time with them. Post on social media! Post pictures of the pet and share any information you can about the dog’s personality. Be sure to tag McKamey Animal Center so interested adopters know where to go. Take the dog out on a walk in a populated area. Be sure to keep the “Adopt Me!” vest on the animal for the duration of your time together. Word of mouth. Tell your friends and family about the dog and encourage them to spread the word as well. The more people the dog is exposed to, the higher the chances that we can find the dog a loving home. Thank you for hosting a McKamey dog and helping us increase his or her chances of going home today!